I ran this picture last year and loved it! 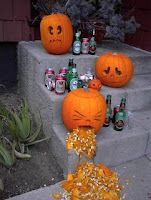 How are you going to carve your pumpkins? The boys usually pick out one design for me to carve and that one goes on our big pumpkin. Then I cut our self adhesive black felt in the shape of eyes, noses, and mouths and the boys decorate their smaller pumpkins. I feel there is neither a right or wrong way to carve a pumpkin. It's all about having fun. But for those of you that are serious. Check these out!